City Councillor Kenneth Reeves was elected and inaugurated to a two-year term as mayor of Cambridge on Jan. 2, replacing Councillor Michael Sullivan. Reeves, who ran against Councillor Denise Simmons, was elected by the Council in a five-to-four vote. William Boone Bonvillian, legislative director and chief counsel for U.S. 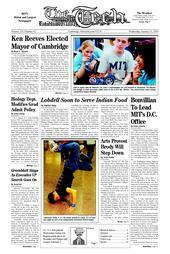 Senator Joseph Lieberman, was tapped last week as the next head of MIT’s Washington Office. During his 16 years working with Lieberman, a Democrat from Connecticut, Bonvillian was deeply involved with science and technology policy. By the first day of spring semester, Lobdell Food Court will be serving Indian food instead of Italian, said Richard D. Berlin III, director of campus dining. Cafe Spice Express, an Indian food vendor, will replace the Mangia Mangia Italian food service in Lobdell. Construction is ongoing, Berlin said. Associate Provost for the Arts Alan Brody will be returning to full-time teaching and playwriting at the end of this academic year, according to an MIT News Office press release. Brody has held the position of associate provost for 10 years, and is an “unswerving and passionate advocate of the arts at MIT,” Provost L. Rafael Reif told the News Office. Brody has also been an MIT professor of theater arts since 1988. In a change to a long-standing policy, MIT undergraduates in the Biology Department are no longer forbidden from enrolling in the department’s graduate program. Sherwin Greenblatt ’62 will continue to serve as interim executive vice president for finance and administration of MIT for up to two more years, while the search for a permanent replacement for former executive vice president John R. Curry continues. The following incidents were reported to the Cambridge or MIT Police between Dec. 20 and Jan. 8. This summary does not include incidents such as suspicious activity, false alarms, general service calls, or medical shuttles. Imminent CollapseThe Future Is When?! Dare Me?Ho, Ho, Ho Indeed!